Home » Pre-Sales Questions » Are your themes compatible with the latest version of WordPress? If you decide to purchase a Premium WordPress Theme by MH Themes you are in good company. 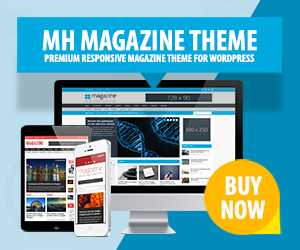 With over 600,000 downloads our products are among the most popular magazine themes for WordPress and thousands of customers in more than 110 countries around the world are using reliable and high-quality WordPress themes by MH Themes. All our WordPress themes are coded while keeping best practices and WordPress Coding Standards in mind to ensure high-quality, clean code and reliable products, that don’t cause a headache. WordPress themes by MH Themes are updated on a regular basis and always tested to work with the most recent version of WordPress. At the moment our themes require at least WordPress 4.5 to work as expected. In case you are using an older version of WordPress, we recommend that you update your WordPress installation before you install the themes to ensure full compatibility. Why is it important to keep WordPress up-to-date? As with every piece of software, it is important to ensure that you always keep your WordPress installation up-to-date. By doing so, you not only benefit from new features and improved stability, but also protect your site against security vulnerabilities. In addition to WordPress itself, you should update your plugins and themes as well. Here you can find additional information about WordPress security: Introduction to WordPress Security and How to Secure Your Website. Great Premium WordPress Themes. We will purchase one as soon as possible. Thanks MH Themes Team. You’re welcome and we’re very happy that you like our WordPress themes. You can also have a look at our showcase where you can find plenty of examples of user sites.